10 Cloverfield Lane opens with a car being blindsided and flung from the road by an unknown assailant. The driver, Michelle (Mary Elizabeth Winstead), wakes up chained down in a bare, concrete room, which she soon learns is part of an underground bunker. The other two inhabitants of the shelter are Howard (John Goodman), the owner and local conspiracy theorist, and Emmett (John Gallagher, Jr.), an innocent country bumpkin. All Michelle knows of the outside world is what the two tell her (i.e. that the air has been rendered unbreathable due to a chemical attack of unknown origin). The film progresses alongside Michelle’s constant struggle for the truth, as Howard is obviously hiding things, and Emmett isn’t exactly a reliable source of information. 10 Cloverfield Lane fits under a lot of genres, but it can be mostly summed up as a fantasy-mystery-thriller. Other than that, however, it’s hard to say much about the movie without giving a lot away. What I can say is that 10 Cloverfield Lane is the “sister movie” to Cloverfield (2008), so both take place around the same time. However, this is where the similarities end. 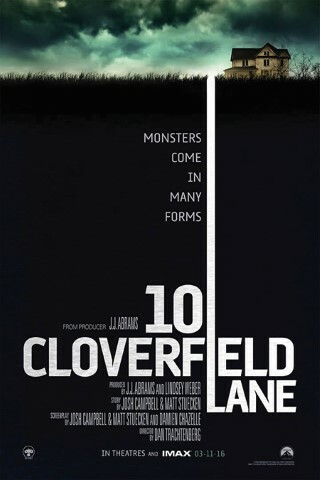 Whereas Cloverfield was known for its shaky “found footage” approach, 10 Cloverfield Lane is filmed more conventionally. Also, both movies follow completely different sets of characters, and they focus on different areas of crisis. For example, Cloverfield centered on immediate survival against a common foe, while 10 Cloverfield Lane looked at the blurred lines of friends and enemies in a long-term sense. One dangerous aspect of the movie is its tiny cast. With only three recurring characters, it would have been so easy for a bad actor to ruin the entire film, but I was pleasantly surprised. Both Mary Elizabeth Winstead and John Gallagher, Jr. performed admirably, and John Goodman was phenomenal. His explosive character was one of the most entrancing things about 10 Cloverfield Lane. It was amazing to watch him go from totally harmless to off the wall crazy all within the same shot; one minute he would be dancing next to the old jukebox, and the next he would be spiraling into a malicious rage. His presence throughout the movie made the threats from the outside seem almost insignificant in comparison. The only negative thing I have to say about 10 Cloverfield Lane is that it waits a long time to give the audience any answers. Of course, half the fun of the movie was trying to figure out the various plots and subplots going on, but the ambiguity became frustrating very quickly. The film does eventually pull out of it, however, so patient viewers will definitely be rewarded. All in all, the movie delivers some great acting, shocking twists, and an eerie feeling that will linger long after you’ve left the theater.